Cover design by Kristina Iulo; Cover © 2010 Hachette Book Group, Inc.
Book 7 in How to Train Your Dragon, the Heroic Adventures of Hiccup the Viking, 255 pp. At the time of this review, 3/7/2017, it holds a 4.7-star review on Amazon. 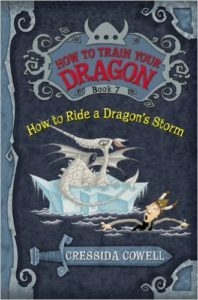 How to Ride a Dragon’s Storm continues Cressida Cowell’s tales told by Hiccup Horrendous Haddock the Third’s tales of growing up the son to famous Viking chieftain Stoick the Vast, leader of the Hairy Hooligans who live on the dragon-infested isle of Berk. He’s a scrawny lad, but not so bad off as his best friend, Fishlegs. He’s every bit as valiant as Camicazi, the daughter of Big-Boobied Bertha, chieftain of the Bog-Burglar Tribe. If you’ve seen the How to Train Your Dragon movies, you have to understand that they are loosely built from the early How to Train Your Dragon books. And by loosely, I mean more loosey-goosey like, Hiccup is true to the book, but Toothless? In the books, Toothless is a tiny, not-so-valiant, not-so-dangerous dragon who’s about the size of an overweight housecat. Toothless does help Hiccup now and again, at those critical moments, but not without priceless cat-like attitudes, like telling Hiccup, “Say, I am a big, wingless idiot and T-T-Toothless the handsomest, cleverest k-k-kindest dragon in the WHOLE WORLD,” before the dragon will help his master defy death. It’s fine if you have not read the previous books. You will still follow along with Hiccup’s adventure, but it’s fun to know the previous run-ins Hiccup has had with the Norbert the Nutjob. The usual Viking friends (and here, I use friends even more loosely than the loosey-goosey of the books’ relationships to the movies) populates the beginning and the ending of the book—Dogsbreath, Snotlout, always picking on him; his father’s friend Gobber, and even grandfather, Old Wrinkly—who can sometimes tell the future, and sometimes not. But mostly, this story belongs to Hiccup & Toothless, Fishlegs & Horrowcow, and Camicazi & Stormfly, and Norbert & his Viking crew. Set sail on a good, old-fashioned Viking adventure blended with references parents may recognize, like a ship named the American Dream 2. It’s a fast read, because the print’s larger for newer readers, and the line drawings scratched out every few pages offer a laugh—this is, after all, Hiccup’s memoir, so one can hardly fault him for doodling as he recollects the harrowing life-and-death challenges he’s survived, or the sincerely crazy Vikings he lives among. A scholar (speaking dragon, and writing about them—two most un-Viking traits if ever he saw), Hiccup figures out how to survive the dragons that interrupt his swim. Reluctant readers might be drawn into the How to Train Your Dragon series the same way Captain Underpants Tails lure them—body jokes, adventure, best-friends surviving un-survivable odds, a dragon who might or might not come to your aid (but at the end of the day, Hiccup is the one who feeds him, so you’re pretty sure Toothless will help), and bullies who never get to have the last laugh, Hiccup is the most unlikely hero to cheer on. C’mon, there’s even an Axe of Doom, Norbert the Nutjob’s weapon of choice, and a fight-to-the-death (maybe) challenge on the mast. Learn more about the next volume of Hiccup’s story, How to Break a Dragon’s Heart, a free chapter at the end of this book. Learn more about Cressida Cowell at her webpage. Find other reviews of How to Ride a Dragon’s Storm at Amazon or your favorite book-review site. Find more of Cowell’s books at her Amazon page, and the inside scoop on Hiccup at her How to Train Your Dragon page—downloads, videos, and other “fun stuff.” Where did her inspiration for these books come from? A father’s stories, and her own life on an island. Have you read How to Ride a Dragon’s Storm? Did you wonder how Hiccup would help the captured boy Bearcub, and his tribe the Northern Wanderers? Have you ever done something for your best friend, though you knew you couldn’t do it—the way Fishlegs is willing to enter a swimming competition to keep his best friend, Hiccup, company? What’s your favorite book in the middle grade range? This entry was posted in Book Reviews, Uncategorized, Writers and tagged amreading, Book Blogger, Book Review, Cressida Cowell, How to Train Your Dragon, Humorous Stories, Middle Grade Fiction, Vikings. Bookmark the permalink.